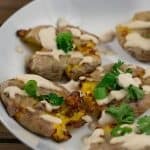 Don’t get me wrong, these smashed potatoes are amazing all by themselves, but when you add my new Vegan Garlic Aioli they are transformed into little bites of pure culinary awesomeness. Boil potatoes in a large pot of water until fork tender – 25-30 min OR……..
Add all ingredients to blender and process until smooth and creamy. You will probably have to stop and scrape down the sides a few times.